Book Malaysia Airlines flights & plane tickets on NusaTrip.com. Search any flight routes, compare prices with other airlines : Simple & Fast, 24/7 instant booking. Find all Malaysia Airlines flights on all routes, get the cheapest fares in Malaysia , Asia, and Europe when booking your Malaysia Airlines plane tickets, cheap, on NusaTrip.com. Malaysia Airlines is the national airline of Malaysia which services domestic and international flights. Malaysia Airlines became a full member of Oneworld alliance since February 1, 2013. It operates scheduled passenger services on network from Kuala Lumpur to 850 destinations in 150 countries within in Oneworld network. Economy Class : The cabin is equipped with comfortable seat. Baggage allowanced up to 30 kg with extra cost for domestic flights and international flights. Malaysia Airlines assured all meals served on board with special dietary needs due to religious or medical reason. Passenger also can enjoy their entertainment in-flight. 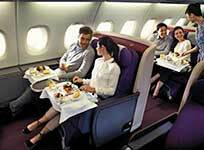 Business Class : The is equipped with luxury and comfortable seats. Baggage allowanced up to 40 kg. Business Class passengers will receive privileges upon check-in and other personal services while passengers wait for their departure documents to be processed in Departures level of KL International Airport. Food with special dietary needs and entertainment are provided in flight. Business Class passengers also can enjoy Golden Lounge facility in Kuala Lumpur International Airport. 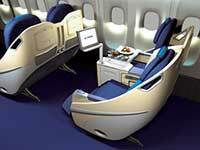 First Class : First Class is offered only on the Airbus A380. Malaysia Airlines First Class cabin is equipped with luxury seats that can be used as a bed, business center and internet access. Food with special dietary needs and entertainment are provided in flight. Baggage allowanced up to 50 kg. As with any Business Class passengers, First Class passengers will also receive privileges upon check-in and other personal services while passengers wait for their departure documents to be processed in Departures level of KL International Airport. First Class passengers also can enjoy Golden Lounge facility in Kuala Lumpur International Airport. Infants are not permitted in First Class due to Malaysian Airlines’ decision not to install bassinets on the cabin. Passengers are permitted one (1) piece of cabin baggage, which must have a maximum length 36 cm, height 56 cm and width 23 cm; the sum of the three dimensions shall not exceed 115 cm or 7 kg. First Class and Business Class passengers are also permitted to bring two (2) pieces of hand baggage with maximum weight 7 kg each. If passenger has infant, they can carry infant food into their baggage with a maximum length 115 cm and weight of 10 kg. Effective 14 February 2013, the maximum baggage limit for Economy Class up to 30 kg, Business Class 40 kg and First Class 50 kg for all destinations. Special for flights to North and South America, the maximum baggage limit is 32 kg for Business Class and First Class, and also 23 kg for Economy Class. 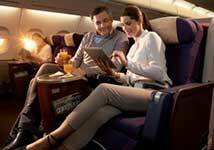 The Select In-flight Entertainment system offers a world of high quality, highly engaging entertainment onboard. From the latest blockbusters to popular TV shows, to multi-player games and critically acclaimed album releases, enjoy your MH Experience with a special selection designed to delight your senses. Portable Player: B737-800 available for Business Class only. Check-in counter may be open between 2 to 4 hours before departure time. Counters are closed 60 minutes before departure time. Passengers are advised to check-in at least 2 hours before their schedule departure time in KL Sentral Check-in counters. Malaysia Airlines reserve the right to change passengers’ seat at any time for operational, safety or security reason. Malaysia Airlines may decide not to carry unaccompanied children, passengers who are ill and pregnant woman if arrangements to carry them have not been made before check in. Ticket prices include food on board for all classes. Meal Boxes are served to Economy Class passengers on ASEAN routes. Malaysia Airlines has decided to levy a fuel-related surcharge on all its International flight services. This is usually included in the price of ticket. Malaysia Airlines will refund a lost ticket as soon as practicable after expiry of the validity period of the ticket on proof of loss and upon payment of a reasonable administration charge. Name changed is not permitted. All tickets purchased are non-transferable to someone else. Malaysia Airlines will refund on unutilized tickets in cash or cheque if passengers paid in cash for their tickets or refund will be credited back into credit card if passengers paid their tickets with credit card. Changes are depends on the fare class (fare brand) and type of ticket purchased. All tickets purchased at promotional fares are not eligible for booking changes.On some fare class, you might need to give us advance notice or risk forfeiting your ticket. In most cases, a penalty fee is imposed.